Excited, jumping off the boat onto the pure white sand and stripping off my shoes and shirt, it was announced by the Apprentice, ‘That’s how you’re gonna stay the whole trip mate, get used to it.’ This was a good thing, considering the 26kg of camera gear I lugged there meant I had room for less clothing than you’d need at a Charlie Sheen Pants-Off Party. 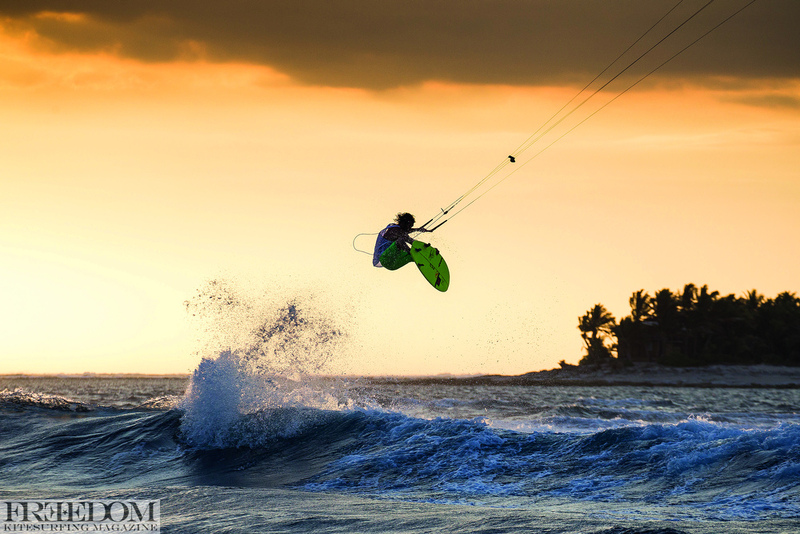 Ian Alldredge – 20 knots, sunset, palm trees, cool beers – Life is good – Photo Stu Gibson. I was rushed straight to a solid looking tender built for bustin’ through waves. Ulai the friendly Fijian boat driver/big wave surfer beams at me with shiny teeth and yells, ‘get on mate!’ As the tender tackles the tricky 2ft shore dump, I throw the pelican case up over the bow and awkwardly flop my body over the side, managing to not skew myself on the anchor. Ulai yells a cry of success and twists the throttle in reverse, churning the boat away from a set of nasty looking dumpers. After arriving at Cloudbreak, we bounce to another tender as Ulai speeds off to rescue some unfortunate soul who’d been washed across the reef for a ‘tower tour’. Coolest angle on Ian’s line mounted camera. Sitting on the boat, grey as a ghost, is Dyllan. With his board in two and looking very disgruntled we do the man shake thing – with more shake in it than man. He explains, ‘Two wave hold-down… Got rolled deep on the third and went to climb up my leggie but there was only half a board’. He pauses and leans forward, coughing up a mouthful of water he chokes, ‘f*ck man, I actually blacked out down there and had to snap myself out of it and make it to the surface’. It’s times likes this when I prefer filming to surfing; I love the surf but spending most of my time geeking out in front of my Macbook means I’m really not built for the kind of punishment Cloudy serves up on a day like this. I happily take a salt-crusted bench seat, setup the trusty Sony and film a highly amusing and somewhat teeth-grinding surf sesh. The island with one of the local breaks peeling off nicely – Pic Stu Gibson. What a way to be introduced to Namotu Island! Only recently have all the breaks in the area been opened up for everyone, not just Namotu and Tavarua guests. Of course this change has both positives and negatives, but without getting into politics, it’s generally a lot more crowded. Yet on a day like this, the crowds are thin…. very thin. Generally there are a lot of places to surf, and coming from a place like Sunny Coast in Queensland the crowds seem like nothing. Paddling in after nailing some solid looking slabs is Ben Wilson, AKA Mr BWSurf, ‘Yew, few fun ones hey! Looks like you had a good session mate’, he says, laughing at the remaining 10 inches of Dyllans board. We speed back to the Island ready for the day’s next adventure – the arrival of eager kitesurfers from all over the world. 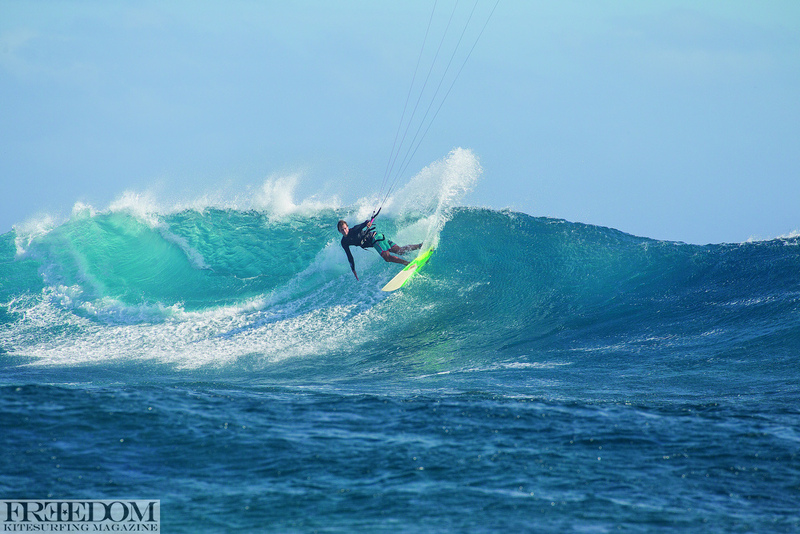 It’s the Ben Wilson Kite Week on Namotu Island and it looks like the swell has geared up to deliver a fresh batch of wave kiting students some serious action, ready or not. 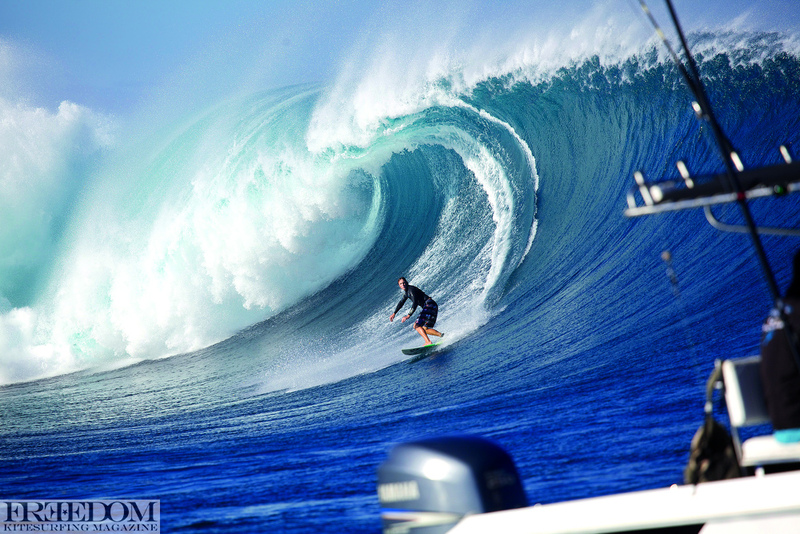 Beau Pilgrim having some fun on the local wave right out front. This wave is really easy going and fun for all levels but does become more advanced when its big and low tide – Pic Stu Gibson. After some kick arse gourmet buffet style grub, the fresh kiters are keen to explore one of the friendlier and highly kiteable waves, Namotu Lefts. Kiters hurry to the launch spot, a roomy and well-equipped sandbar, complete with everything from experienced kite launchers to a powered compressor. And who could forget Wanga’s Beach Bar, where the man himself serves up icy cold Dutch courage and hard-earned refreshment for anyone in need. It’s a short tack out to the break, best done on a mid to high tide although still very kiteable on a low, though only for the more advanced kiters travelling with extra fins! As the guests head out, Stu and I follow in a boat to shoot an afternoon of thrills and carnage. Ian sunset fly time – Pic Stu Gibson. One very eager and unfortunate chap learned this lesson the hard way, experiencing what’s called ‘first wave syndrome’. One of the boatmen yells across the radio, ‘we just found a kite but no rider’. Freaking out, we speed off with an army of the Island’s surf boats to find the fallen kiter. Inspecting the bar and lines still attached to the kite, we notice the safety has been snapped… and that’s when we get really worried. Fortunately, only a few moments later, a whistle of relief is heard over the radio, ‘We got him’. Phew! So we head back to continue filming. Later I spoke with the lost rider and asked what happened. Apparently his harness snapped and he lost his kite. Huge swell coupled with dark clothing made him almost invisible to the search boats. My hat’s off to the Island’s impressive search and rescue team, and in Scotty, the resort owner’s own words, ‘We haven’t lost anyone yet!’. Greg Norman Jnr – Pic Stu Gibson. KNOW YOUR LIMITS & HAVE A PLAN! 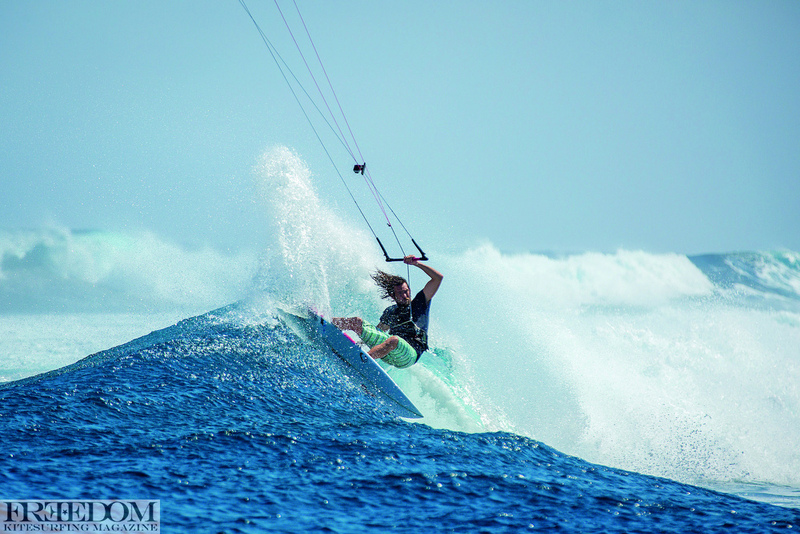 The cool thing about Ben Wilson’s Kite Week is this: He will drum safety, kite position, body position and much more into your head during the week’s daily coaching sessions. 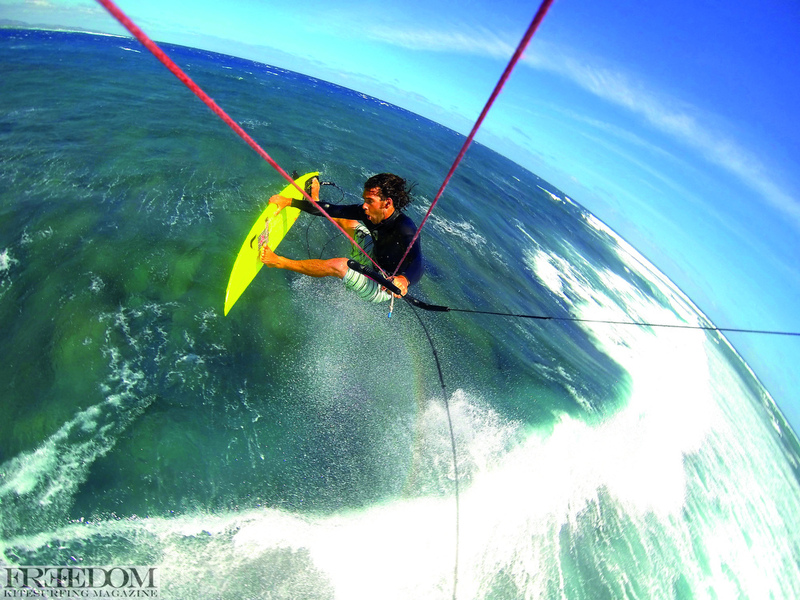 If you want more from your kiting, these are the weeks for you. Of course, you can book at other times of the year too – it’s open for anyone and is definitely one of my top places to kite. Wow, what a banging start to the week. Eventually the wind died down late in the afternoon, replaced with Vonu (local drop) and stories flowing steadily from the Beach Bar. The following days were filled with some incredible surfing, whale sightings and a trip to a floating bar called Cloud9 – very cool. 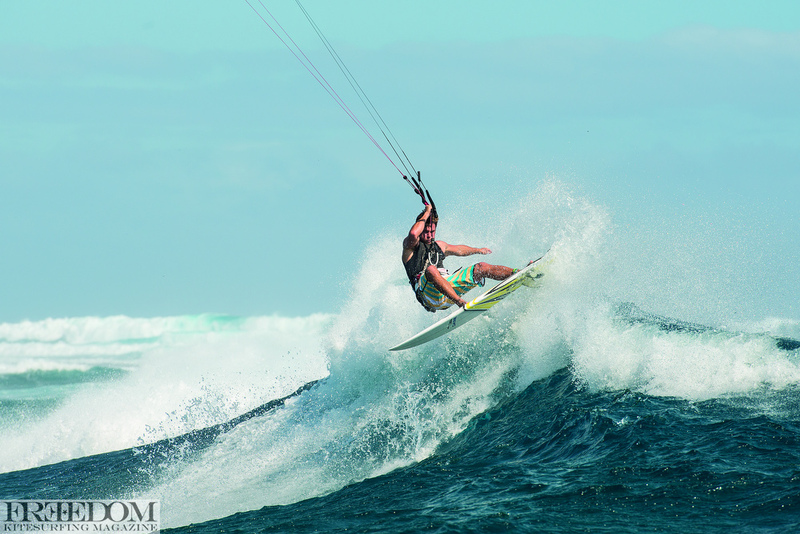 The wind dropped off for a few days but returned later in the week for more highly froth-able kiting sessions. Usually most days you can start off with a early to mid morning surf before the trade winds set in. It really makes for the best day when you can surf and then kite in the same day! 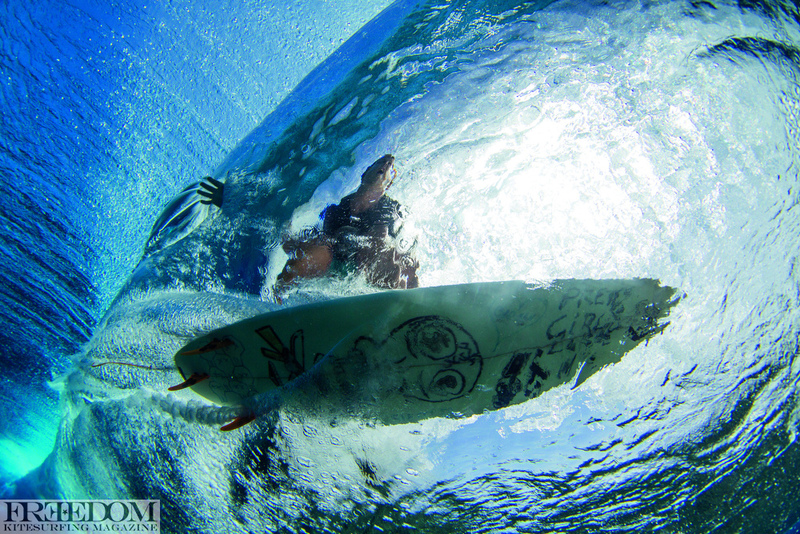 Gretta Kruesi checking out the options – Pic Stu Gibson. Generally it’s windy July to August. Most days you can expect glassy surf in the early to mid morning, then the trade winds swing in after lunch before dying off in the late afternoon. 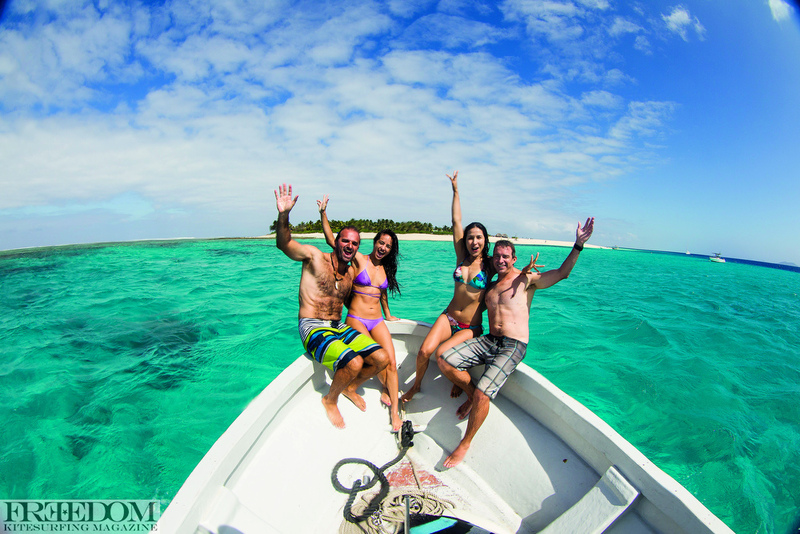 Being able to surf in the morning and kite in the afternoon would have to be the most perfect way to spend your day but if that’s not for you, you can SUP, snorkel, go fishing, kayaking, outrigging and sailing, all of which are included in the price. Once you’re there you can put away your wallet (until you pay your bar tab…. ), no need to hire anything (BYO kite gear). It’s there and you can take it when you please. During Ben’s Kite Weeks there are also yoga and stretch classes – not just for the missus, after a few solid days of non-stop action you will need to attend as well! 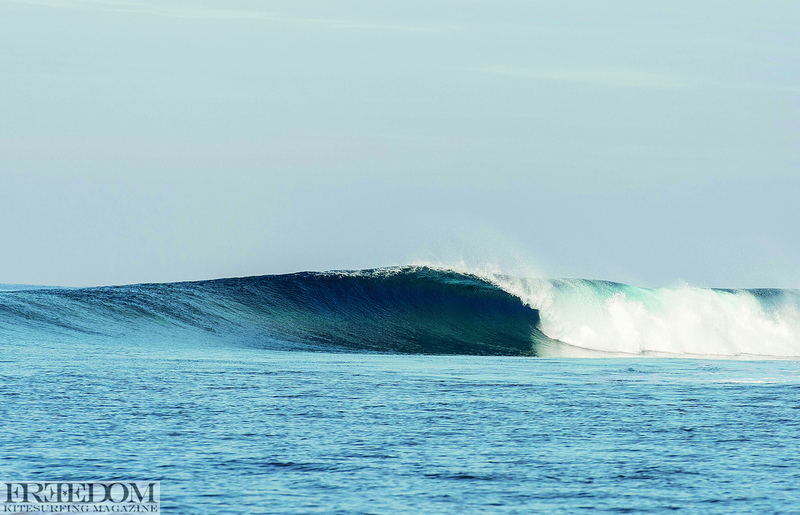 Ahhh fiji… enough to make a grown man cry – Pic Stu Gibson. There’s no elaborate mariner, jetty or fancy day spa. 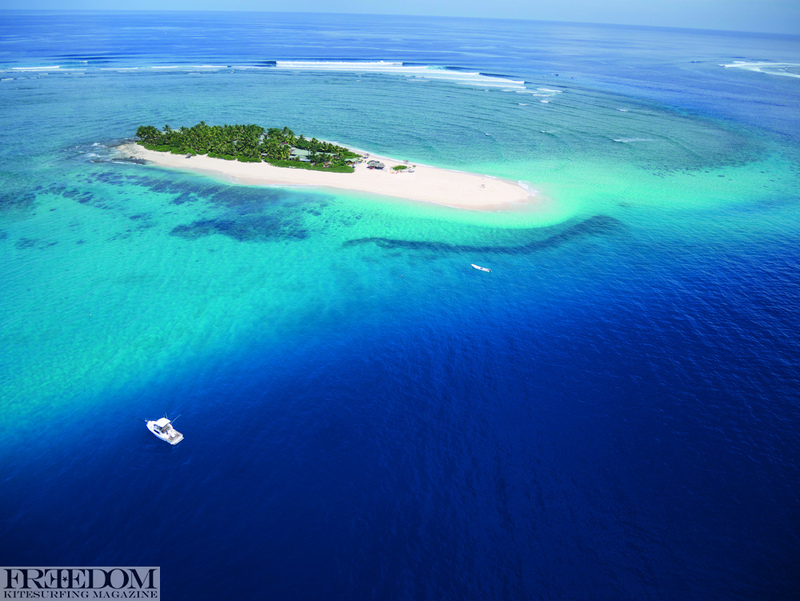 It’s simple but pure – small tropical island with palm trees and white sand. A full beach goer’s paradise with crystal clear water.. The accommodation is nice and clean and very comfy with options from 6 man dorms to king size couple hideaways. Rumour has it this is where a big part of the Tom Hanks movie “Castaway” was filmed – not a bad place to be stranded I reckon! Ian laying down some serious rail – Pic Beau Pilgrim. The resort is centred around the pool bar and restaurant. Complete with Jacuzzi and probably the best piña coladas you have ever tasted, this is where you’ll spend time chowing down delicious meals and chatting to surfers, businessmen, bankers, kiters, SUP’ers, fishos and divers from all over the world. This resort is perfect, not only surfers, but kiters as well. There are plenty of boats to follow you in case of an emergency and highly skilled staff to help you when sh*t goes down. The resort’s lifeguards put their life on the line to help out in sticky situations, peeling guests from a reef or dragging them back to the boat after a multiple wave hold-down. Fiji has some of the clearest waters in the world – Pic Stu Gibson.